Polish citizenship for the dwellers of the former Prussian Partition. Residence right - is a right to public affiliation with a commune, with its community, introduced within the territory of the Austrian Empire by the Act of 3 December 1863, which applied also to the Poles residing within the territory of the Austrian Partition. The residence right in a commune that, after the 1st World War fell within the hands of the 2nd Republic of Poland, under Article 70 of the Peace Treaty with Austria of 10 September 1919, was related to acquisition of Polish citizenship by operation of law. Irrespective of the provisions of the abovementioned Peace Treaty with Austria, ratified by Poland on 22 August 1924, the 2nd Republic of Poland, under Article 2 point 1 of the Act of 1920 on the Citizenship of the Polish State, recognised the residents of the former Austrian Partition as Polish citizens in general, if they had the right of residence, i.e. the abovementioned right of municipal affiliation, meaning a public relationship between an individual and a given commune, and not only actual residence, whether long-term or not, within the territory of a given partition. 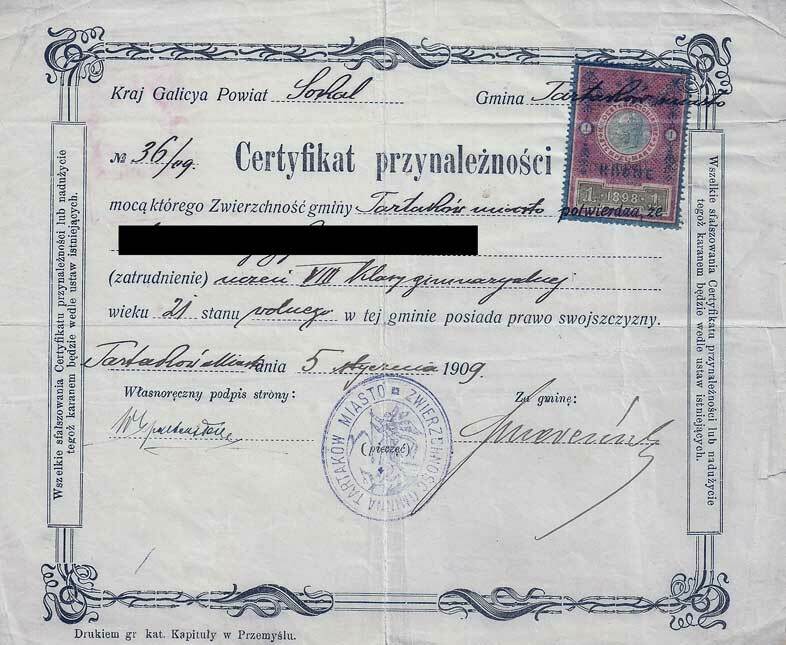 By means of said legal procedure, it was possible for the Poles originating from the former Austrian Partition and remaining abroad, to get Polish citizenship, unless they acquired the citizenship of a foreign country before 31 January 1920 by the fact of birth within its territory or by naturalisation. What was and how could one acquire the right of residence, so important for being considered as a Polish citizen - that was determined in the 2nd republic of Poland by relevant laws of Austria, i.e. the above-mentioned Act of 3 December 1963 - it is, therefore, worth a closer look. The core of the legal construct of residence right is explained by paragraph 1 of the aforementioned act, which states that: "The right of residence in a certain commune gives the right to undisturbed residence in such commune and to claim support in poverty." Paragraph 2 stated the basic limitations in granting the said right: "Only the citizens of the Country (i.e. Austro-Hungarian Monarchy) may acquire a right of residence in a commune. Every citizen of the Country could use the right of residence in one of the communes. The right may be granted in a single commune only." The Act of 1863 fixes the ways of acquiring the right of residence. By being appointed as a public officer"
Patagraph 6 explained the ways of acquiring the right of residence by birth - children born from a married couple acquired the right in a commune where it was granted to their father as of the date of child's birth, and children born outside marriage acquired the right in a commune where it was granted to their mother as of the date of their birth. The right of residence could not be acquired by adoption or by being accepted for upbringing. By marriage, a wife, according to paragraph 7, acquired the right of residemce in a commune where it was granted to her husband. According to Paragraph 8 of the Act, the commune had an exclusive right to accept an applicant as "resident", i.e. to grant the right of residence. Paragraph 10 of the Act concerned granting the right of residence to officers and stipulated that "Permanent royal, governmental, national, fiscal officers, clergymen and public teachers acquire the right of residence upon being appointed as an officer in the commune where their office was vested upon them." in the commune where they were born.